Suz and Fred, my sister and brother-in-law, took a chance that paid off. Rancho Alegre hired workers from Community Gatepath. From a cloudless sky, the sun beats down over the fields of Rancho Alegre and the scent of lavender lingers in the still air like a San Francisco fog. Despite the seeming tranquility, on this day the air is the only thing that is actually still, at the five-acre lavender farm nestled in the wooded Pescadero hills. At the far end of a field, six workers and their job coach cut lavender off the stalks with sharp Japanese sod cutters and put the tops into buckets. From the buckets, the plants go into a trailer, and from there, they will eventually be cut, bundled and dried, and then the oils will be extracted to be put in soaps, lotions and perfumes. The work is repetitive, the days are hot and the bees are abundant. One worker was stung twice in a day. But the workers don't complain, their supervisors say. They always show up on time, and never call in sick. Many, in fact, express how happy they are to work. These day laborers have diagnosed developmental disabilities. They are part of the landscape division of Community Gatepath, a Burlingame-based non-profit organization supporting children and adults with disabilities, with an aim to help them achieve full potential in health and work. Out in the field, Delvon Houston, a Community Gatepath field worker, talks as he cuts, "It's fun once you get used to it; you just have to be fast at it," he says as he cuts slender stalks with a cutter and lays them on the ground for someone to pick up. "I just pick as much as I can," he says. Jessica Ertel, the workers' supervisor, walks up and down the rows of lavender, throwing out words of encouragement like candy in a parade. "I think it is amazing to see the amount that is accomplished by people who are otherwise ignored," says Ertel, the landscape business manager for Community Gatepath. Although they work at different landscaping jobs through Gatepath during the week, these workers have been at Rancho Alegre two days a week during the harvest, which will end later this month. Their disabilities range from severe depression to autism to mild retardation. 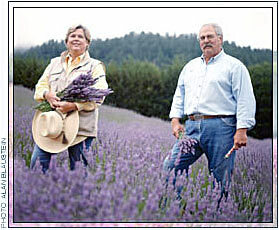 At Rancho Alegre, the most able workers are put out in the fields to cut lavender. "They're good folks," said Fred Brittle, co-owner of Rancho Alegre. He looks over the crew as workers toil under the relentless sun. "These guys, they're smart enough. They know what their strong points are and what their weak points are," he said. Brittle and his wife Susan Ditz were first introduced to Community Gatepath last fall through a family contact when they needed workers to fill lavender sachets. Recently, Ditz and Brittle found themselves needing field labor when a family of workers moved away. They asked Ertel if they could possibly hire field workers through Community Gatepath. Ertel came out to the ranch and, after looking it over, said the task at hand was a perfect match for her workers. At first, Ditz and Brittle were a little nervous about hiring workers with disabilities. But their fears soon gave way to a feeling that they had done the right thing. "They learned how to do it and they were doing it," said Ditz. "They did it well and efficiently." Both Ditz and Brittle soon realized that their investment had a two-fold return. For them, a trained and willing work force was available to show up on time and get the job done. The work speed was a little bit slower than average, but it was always steady and reliable, said the owners. "Slow and steady wins the race," Ditz noted. For the workers, the endeavor gave them a chance at a paycheck - something that not many other companies would be willing to risk. "These people are fully capable of working in an agricultural situation," said Ditz. "And these are people who are really eager to be independent and make a contribution. "I feel like we're making a contribution and they're making a contribution," she said. Community Gatepath took away some of the trepidation of hiring disabled workers by introducing a training program. Non-disabled job coaches oversee workers every step of the way, training them until the job is mastered. And the job coaches are always available to assist the workers should a problem arise. The non-profit organization also constantly pushes its workers to do better and better. "I want us to be faster every day," said Ertel. "I expect that we are always improving." The landscaping company is a real business like any other, with projects all over the Peninsula, Ertel said. And like any business, the supervisors are constantly trying to increase productivity and encourage workers to excel. Ditz and Brittle saw the benefits right away, especially for their small business, where high turnover and the need to retrain workers often has a significant impact on the bottom line. "Once you've trained a worker, it's a feather in your hat not to retrain them, " said Brittle. "That takes a big monkey off of the small businessman's back. That makes for a big difference." They also realized that fear was often the only thing standing in the way of hiring someone with a disability. For many employers, the word disability translates to liability, and becomes almost impossible to overcome, they said. "It's human nature," said Brittle. "All of a sudden it's blinking out there as a caution light"
If it is a caution light, approach it cautiously, he said, but still give it a chance. It's a message that Community Gatepath hopes that other companies will hear, not just with the landscape division but with other aspects of the program as well. Ditz and Brittle know they took a risk. They also know they are coming out of the harvest with a new crew of workers and a feeling that they made a difference to a group of people that is often not valued as contributing to society. "That's the ultimate goal, for them to be able to get paid so that they're contributing to society," said Ditz. "When you don't understand, it's very easy to just go 'OK, that wouldn't work"
Thanks for posting this Liz, and give my thanks to your sister and her husband. A couple of the programs at the non-profit I work for are support for finding, coaching and keeping gainful employment in exactly the same manner. The rest are various living and community involvement supports. Most of the active folks I work with, simply need a chance to prove what valuable workers they might be and most potential employers don't realize or are afraid. There are a few large commercial organizations (Home Depot comes to mind, but there are others) who have learned the kinds of valuable employees they can have if they extend their hiring practices, but most are wary. If other businesses hear the word, perhaps more will take the chance. I am pleased to hear about this kind of success story. I work with students with disabilities as a special education teacher. I printed this to share at school.